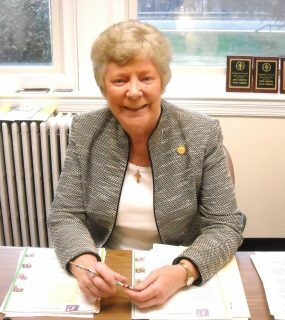 Dominican College Campus Minister Sister Barbara McEneany is an excellent resource person and is always available for any type of counseling, spiritual guidance or referrals to other supportive services. The Office of Campus Ministry is about assisting all students, faculty and staff with fostering their spiritual growth and involvement in community service programs. The office offers Sunday Liturgies, retreats and prayer gatherings plus informal pastoral counseling, where conversations about God, faith-life needs and challenges to be faced are welcomed. Sister Barbara McEneany, class of 1966, has been the Campus Minister for 28 years, where her influence has extended far beyond her office and the sphere of religious counseling and activities. She has an infectious personality which radiates warmth and concern. Consequently, she is a support for all types of students: athletes, student leaders, academically and socially at-risk students, as well as those with personal and/or spiritual concerns. She is an exceptional informal counselor for students who gravitate to her because of her caring and non-judgmental approach. Sister Barbara is a regular presence in the hallways of Casey Hall, where she identifies the melancholy of students with concerns, assists them in dealing with the issues or makes referrals to other sources of help. She also celebrates their successes in dealing with life’s challenges.
. Big Brothers Big Sisters of Rockland Education Award.
. Inducted into Dominican College’s Athletic Hall of Fame for Her Dedicated Service.
. The New York Blood Center’s Laura Blanchfield Award for the Volunteer Blood Drive Campaign.
. The 50th Anniversary Medal for Significant Contributions to Dominican College in the area of Service. The Rockland County Times learned from Sister Barbara McEneany that members of the Campus Ministry Club are given the opportunity to make a difference in the community by volunteering in many and varied outreach programs. Some include Midnight Run, where food and clothing are delivered to the homeless, outreach to the children of migrant workers, Relay for Life, the Big Brothers Big Sisters mentoring program, volunteering with the women in the Bedford Hills Correctional Facility plus blood and clothing drives. New projects are regularly developed in response to student requests and the urgent needs of the people. Sister Barbara McEneany serves as a member of many organizations including: Member of the Advisory Board of St. Dominic’s Home, Dominican Higher Education Council for Volunteerism on the National Level, Member of the Dominican Connections Council, Member of the Strategic Initiatives Planning Committee, Member of the Crisis Team Committee and Advisory Board Member of the Preaching in Action Committee.